The main difference between monocytes and lymphocytes is that the monocytes are responsible for the destruction of pathogens by phagocytosis whereas the lymphocytes are responsible for triggering a specific immune response. Furthermore, monocytes can invade tissues to transform into macrophages or dendritic cells while lymphocytes occur in the circulation. Monocytes and lymphocytes are two types of white blood cells circulating through the blood. Both of them are agranulocytes as well. Monocytes are a type of agranulocytes which differentiate from monoblasts. Around 2-8% of the total white blood cells are monocytes. Also, the size of a monocyte is comparatively large and is three times the size of a typical red blood cell. Furthermore, the nucleus of the monocytes is also large and kidney-shaped. Moreover, the monocytes are considered one of the most efficient types of phagocytes. Though they typically occur in the circulation, monocytes can invade tissues to become either macrophages or dendritic cells. Besides, the main function of these cells is to destroy pathogens by engulfing them through phagocytosis. There are two types of macrophages classified based on their function: wandering macrophages and fixed macrophages. The wandering macrophages travel through the body to find pathogens. Moreover, they are abundant in the skin and the mucous membranes. On the other hand, the fixed macrophages remain in the connective tissue. Furthermore, the cytokines secreted by the monocytes in the infected area attract neutrophils as well as fibroblasts. Lymphocytes are the other type of agranulocytes that account for 20-30% of the total white blood cell count. Also, they have a significantly high lifespan when compared to the other types of blood cells. The three main types of lymphocytes are T cells, B cells, and natural killer cells. T cells – They mature in the thymus under the effect of the hormone, thymosin. Around 80% of the circulating lymphocytes are T cells. Moreover, there are several types of T cells including killer T cells, helper T cells, suppressor T cells, and memory T cells. T cells are involved in cell-mediated immunity. B cells – They recognize foreign antigens and produce specific antibodies against them. Therefore, B cells are mainly involved in the humoral immunity. T helper cells are responsible for the activation of B cells to produce antibodies. Natural killer cells – This is a type of lymphocytes which destroy infected body cells by bacteria or viruses. Additionally, the special proteins secreted by the natural killer cells are responsible for the destruction of the infected cells. Monocytes and lymphocytes are two types of agranulocytes that circulate through the blood. Also, both are important for triggering an immune response against pathogens. 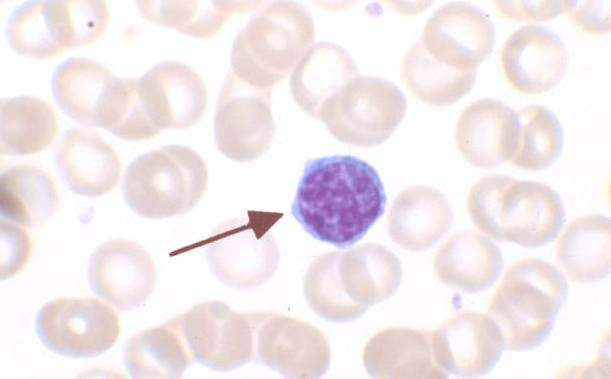 Monocytes refer to the large phagocytic white blood cells with a simple oval nucleus and clear, greyish cytoplasm while lymphocytes refer to a form of small leucocytes (white blood cells) with a single round nucleus, occurring especially in the lymphatic system. Hence, this is the primary difference between monocytes and lymphocytes. Monocytes account for 2-8% of circulating white blood cells while lymphocytes account for 20-30% circulating white blood cells. Hence, this is a major difference between monocytes and lymphocytes. Size is another difference between monocytes and lymphocytes. 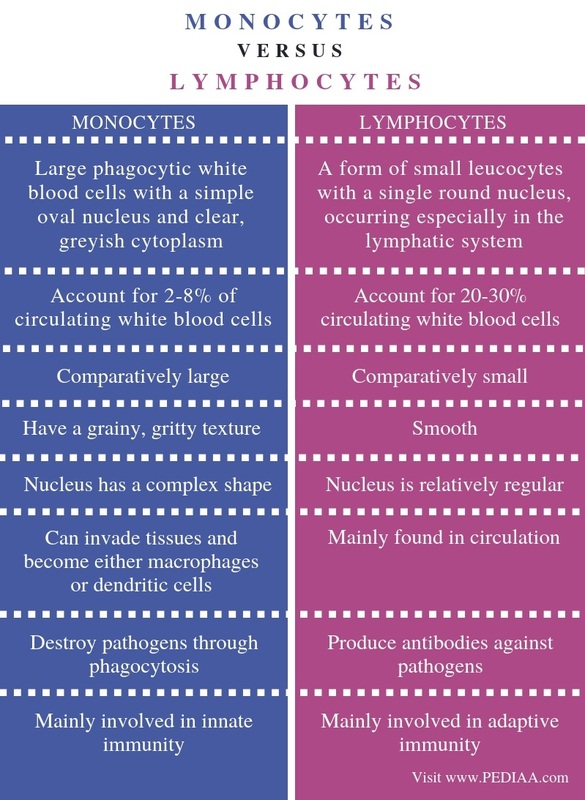 Monocytes are large while lymphocytes are comparatively small. Also, monocytes have a grainy, gritty texture while lymphocytes are smooth. Furthermore, the nucleus of monocytes has a complex shape while the nucleus of lymphocytes is relatively regular. Another difference between monocytes and lymphocytes is that the monocytes can invade tissues and become either macrophages or dendritic cells while lymphocytes are mainly found in circulation. Moreover, monocytes destroy pathogens through phagocytosis while lymphocytes produce antibodies against pathogens. Finally, monocytes are mainly involved in innate immunity while lymphocytes are mainly involved in adaptive immunity. In conclusion, monocytes are a type of agranulocytes involved in the destruction of pathogens by phagocytosis. They become macrophages or dendritic cells by invading tissues. On the other hand, lymphocytes are the other type of lymphocytes responsible for adaptive immunity. The three main types of lymphocytes are the T cells, B cells, and the natural killer cells. 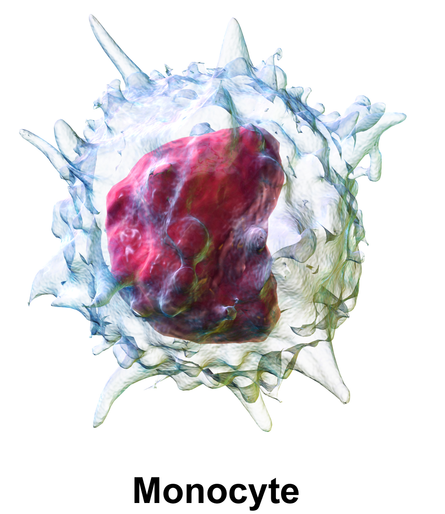 The main difference between monocytes and lymphocytes is the role in the immune system.